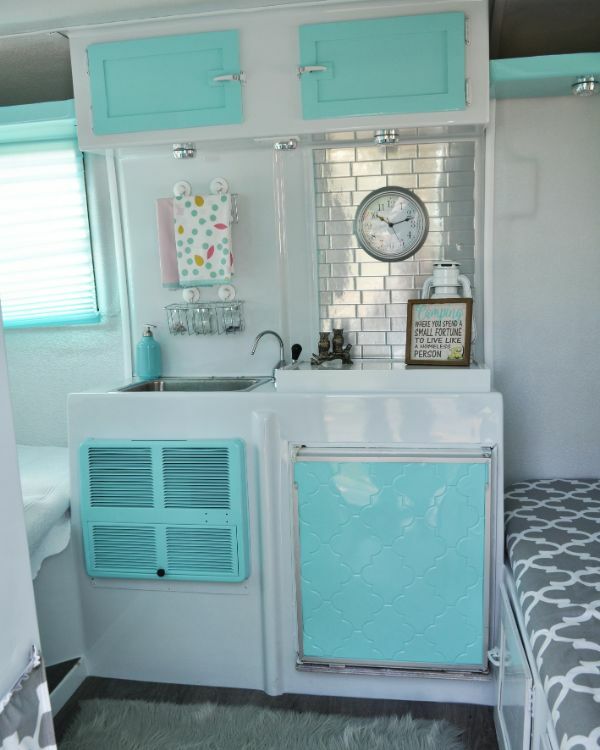 When Tracy Robb and her family found this 1975 Trillium trailer, they immediately fell in love. 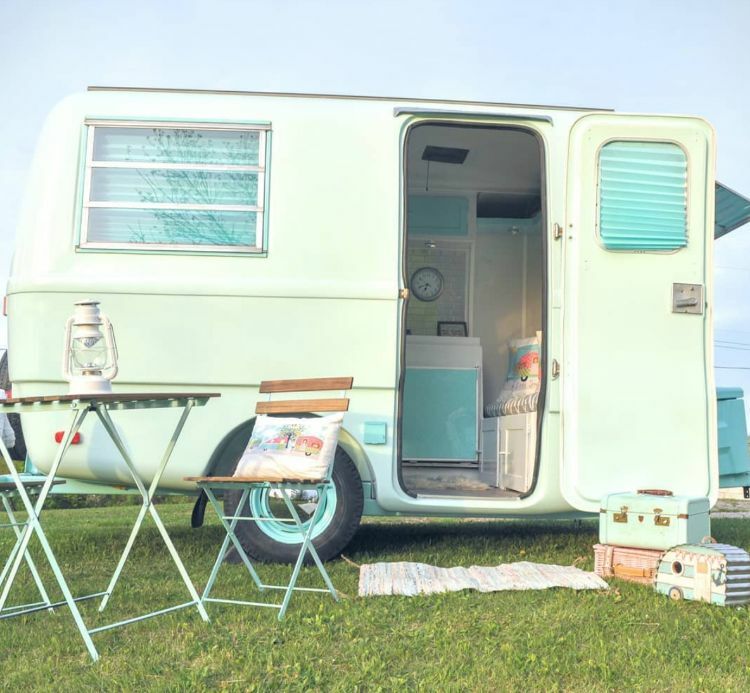 Although the tiny camper showed its age and was very run down and outdated, Tracy was ready, willing and able to take on the renovation task — despite never having renovated a camper. 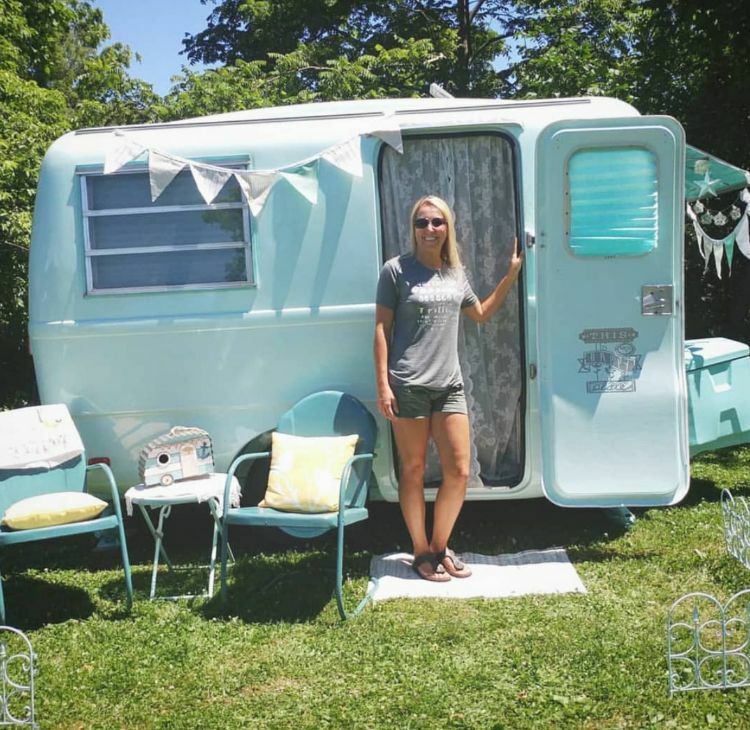 The Robbs bought this camper on the spot for $4,200 three years ago, and they enjoyed the camper as-is for the first year of ownership. 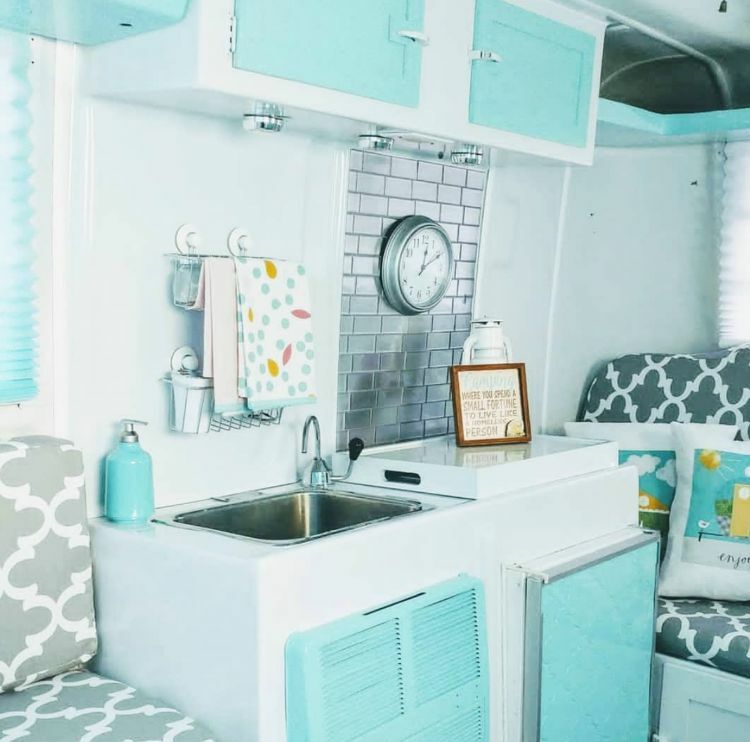 Then, over six months' time, Tracy taught herself how to do everything from building custom cabinet doors to removing, resealing and reinstalling the windows to installing flooring and reupholstering the cushions. Soon, this little trailer was reborn. They named her Jellybean, and she has been part of the family ever since. When Jellybean first joined the Robbs, she was structurally sound but not very visually appealing. Trillium trailers have been made in Alberta, Canada for decades. They are quality, lightweight, fiberglass trailers that are very durable and easy to tow even with just a car. They are known for their longevity and sturdy construction, and they are built nearly the same today as when their construction began more than 40 years ago. 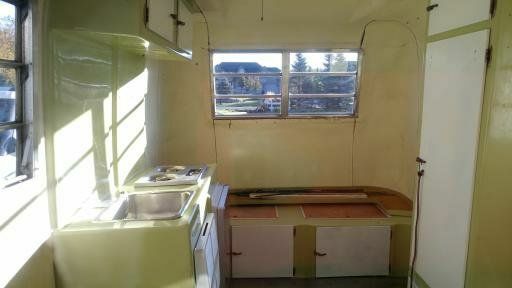 The interior of this trailer was extremely outdated and was likely all original. 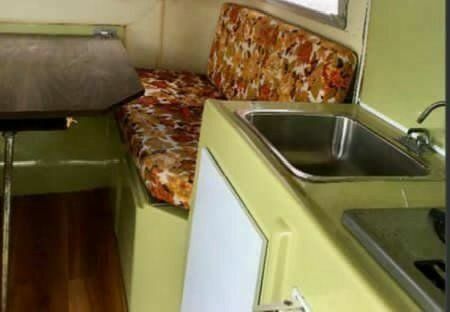 The colors and patterns were what one might expect when imagining a camper from 1975. 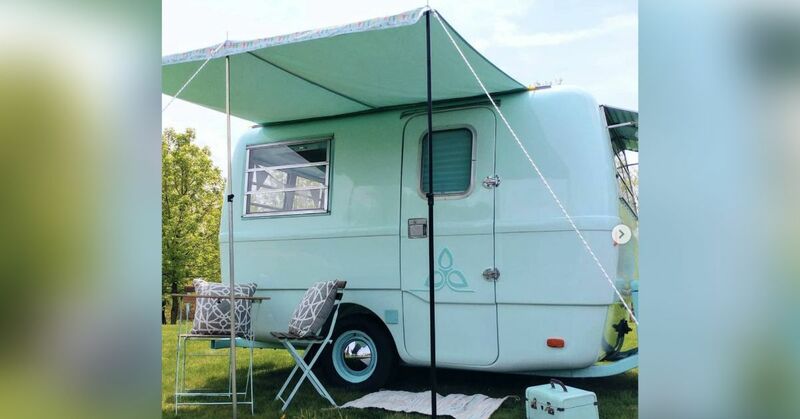 Although Jellybean's style was appropriate for the era and might appeal to some, Tracy knew that with her ideas and creativity she could update this camper while still paying homage to its past life in a previous, golden era. The fabric on the cushions was in incredible shape considering their age. Still, the floral pattern really aged the space, and although busy and unique, they were not quite what Tracy sought for her weekend home away from home. 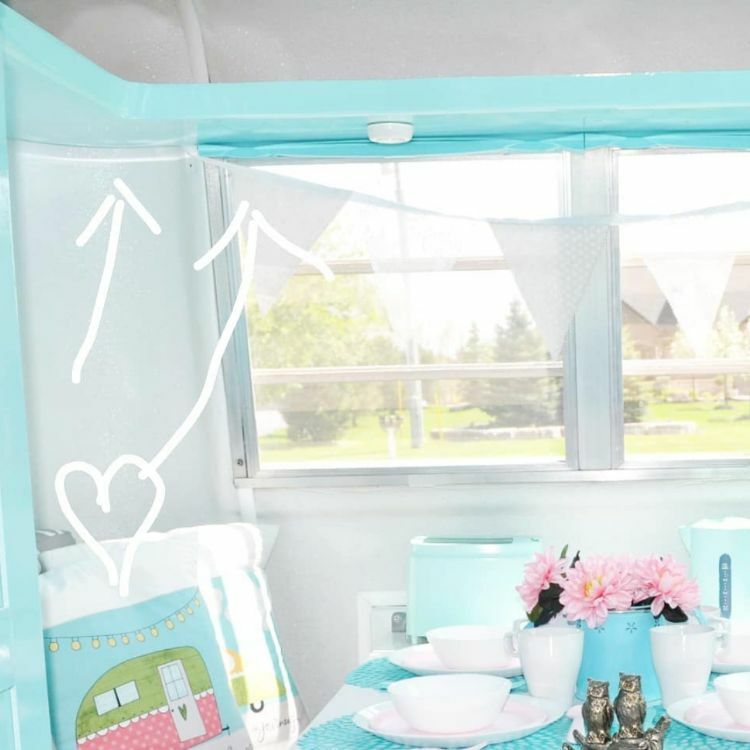 Although everything inside the camper was in good condition, the space felt drab and plain. Trillium trailers are only 13 feet long, but they are set up in a way that feels spacious. The faded paint and uninspired color selections inside Jellybean, however, made her look smaller and melancholy. The most expensive part of Jellybean's renovation was the new exterior paint job, which Tracy had done professionally. It was worth it. 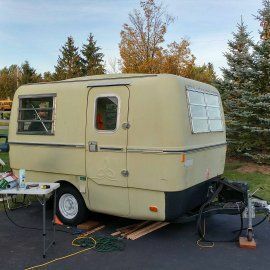 Although it cost $3,200 to have it painted, this update alone gave this little trailer a whole new lease on life. Tracy completed all the interior work and design herself — and what a victory it was. 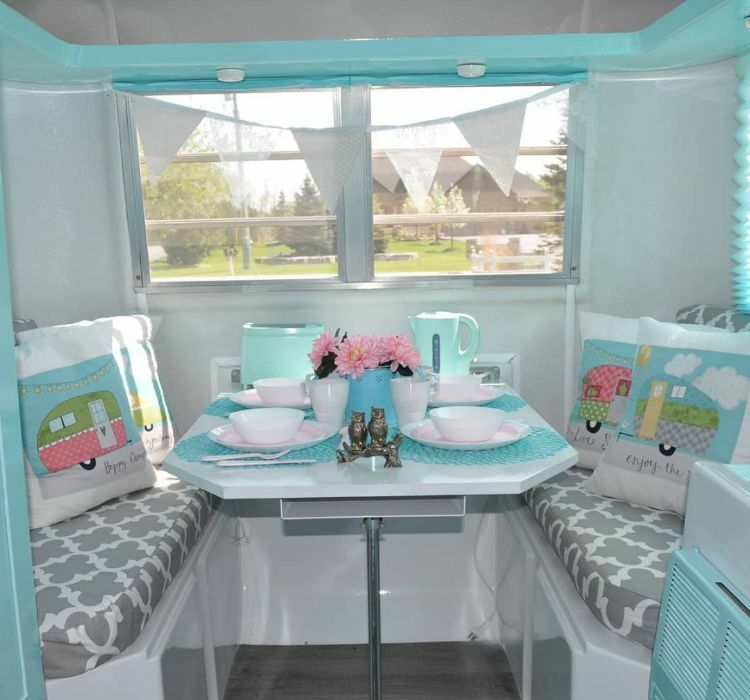 This dinette is so inviting and features lively blues and grays along with some pillows that celebrate camper life. The broad window offers great views when the Robbs park Jellybean in the woods or along a beach. 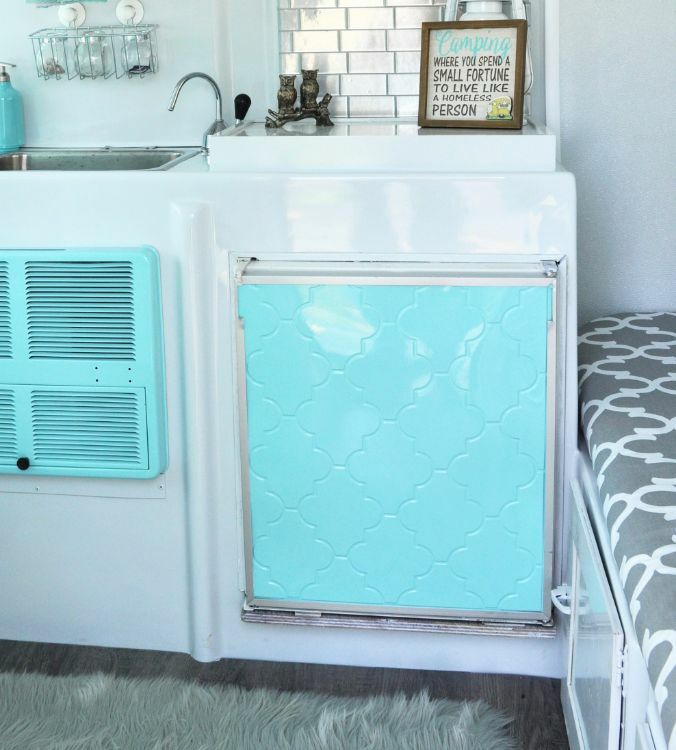 When converted into a bed, this area looks even more inviting. This nook would be a cozy place to relax on a rainy afternoon. 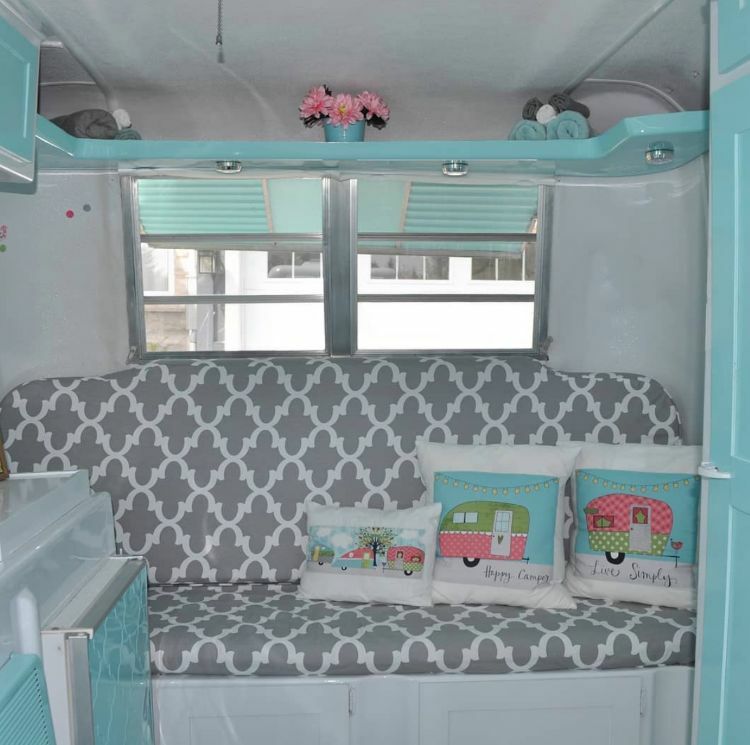 The couch converts into bunks just right for Tracy's two daughters. It's comfortable seating during the day and convenient for sleeping at night. Tracy spent $355 on new cushions and $240 on fabric. She covered the cushions herself in her first excursion into upholstering. The kitchen area really shines and is Jellybean's true showpiece. Tracy customized the cabinets for $160 and invested about $800 on the interior painting and molding. Again, this was well worth it — the overall look is breathtaking and it appears as if Jellybean is brand new, not more than 40 years old. Tracy calls her design style "fresh vintage." She says her goal was "to reflect the original era but also bring in a bit of myself while still keeping it tranquil and relaxing." She succeeded. These colors are an inspired choice. It seems airy, fresh, and free, and the bright blue really guides the viewer's eye around the space. Tracy found a variety of smaller accents to decorate the space. 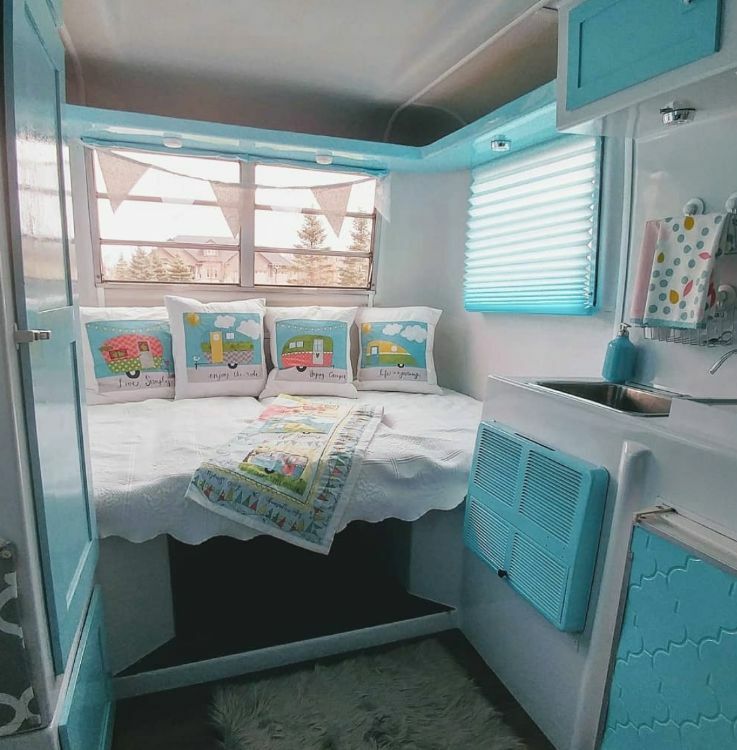 Her attention to detail really helps to make Jellybean feel more like home for the Robbs by allowing them to express their family's personality while traveling together on the road. Tracy installed this overhead shelf for more storage all around. It is easy to reach and keeps small, light things out of the way but still accessible. 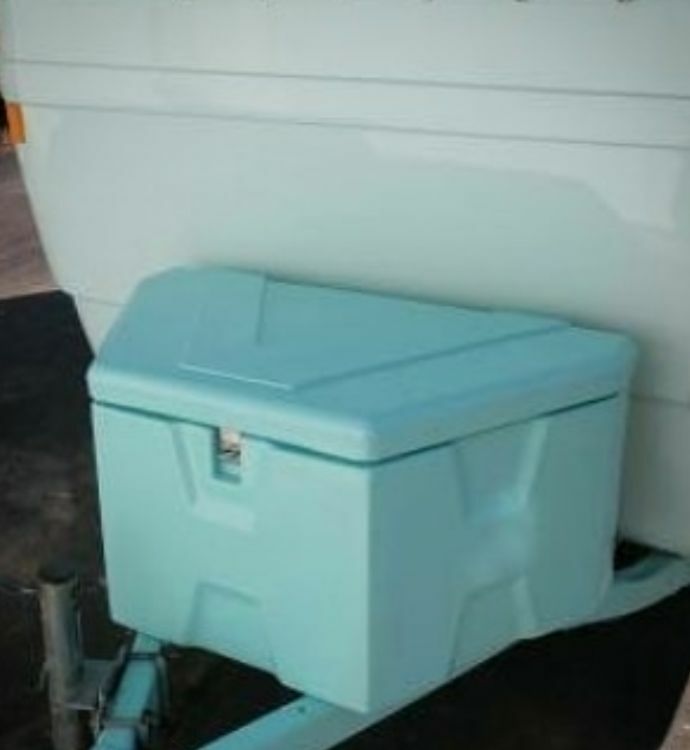 For even more space and storage, Tracy added this storage box. It was originally black, but once she painted it in the accent color, it fit right in with Jellybean's overall look. 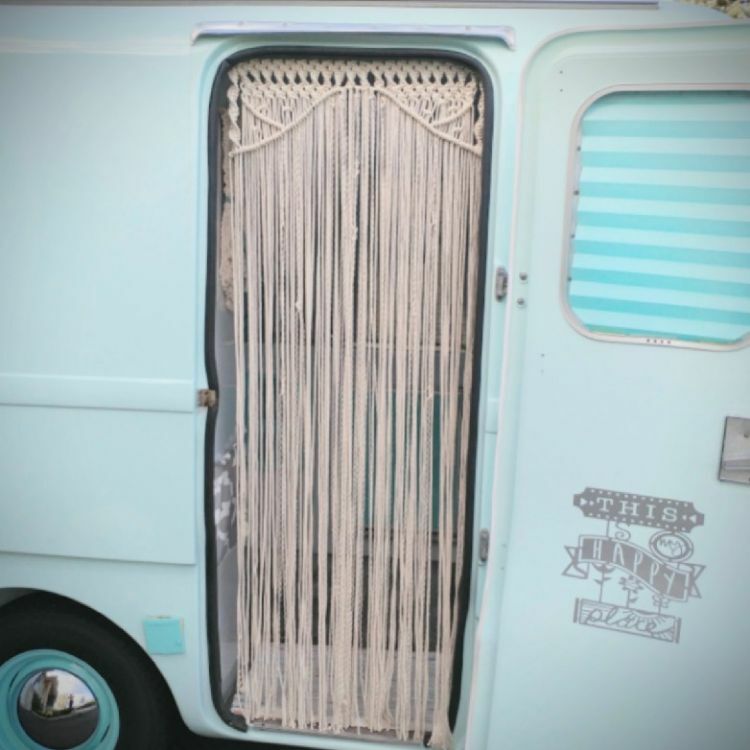 This macrame door hanging is not only beautiful, but it helps to keep the bugs out when camping, while allowing the family to enter and exit with ease. Tracy is very proud of her renovation experience and encourages others to follow her lead. She says, "If you are handy, I say, GO FOR IT! 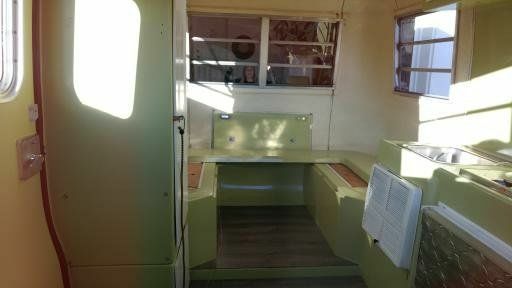 You will enjoy restoring and camping in your very own beautiful, tiny, fiberglass trailer."